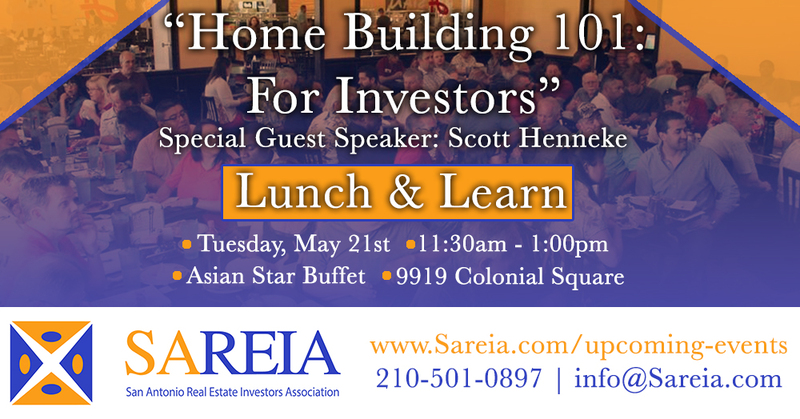 San Antonio Real Estate Investors Association - Lunch & Learn - "Home Building 101: For Investors with Special guest Scott Heneke"
Lunch & Learn - "Home Building 101: For Investors with Special guest Scott Heneke"
Real Estate attorney, investor, broker and president of SAREIA, Victor Maas. As many of you know, Victor has been investing in Real Estate for over 15 years. In addition, Victor has closed 100's of transactions ranging from Sub-2 deeds to full-blown rehabs. Please join us as we discuss investing in new construction. We get so many questions about this specific niche in real estate investing we thought it would be best to bring in a local expert who focuses on new construction investing.